On Monday 18th April 2016 I awoke with butterflies fluttering inside my tummy. Today was the day that I had been counting down since I was 16 weeks pregnant. The day that our little boy would be born. To say that I was nervous is a complete understatement- I was absolutely terrified but I tried to hold it together. We dropped Mads off at her Grandma’s at 7am before heading on to drop LL off at nursery at 7.30am. We then made our way to the hospital, arriving at 8am as requested. We already knew that there was one other elective c-section booked in that day and we were hoping with all our might that we would be the first one. They do it in terms of priority, e.g medical need and last time with LL we had to wait until almost midday before we went into theatre. We headed up to labour ward and was told that we were first- thank goodness. We were shown into a room with two bays and told that someone would be with us shortly. Throughout my whole pregnancy I had been so incredibly nervous about the prospect of a third c-section. My second c-section with LL didn’t go as smoothly as I hoped, I lost a lot of blood, it took a long time due to scar tissue, and it generally made me feel a bit anxious. At my 16 week consultant appointment I was told that I had a lot of scar tissue build up, with scar tissue fused to my bladder so the operation might be a little more complicated. 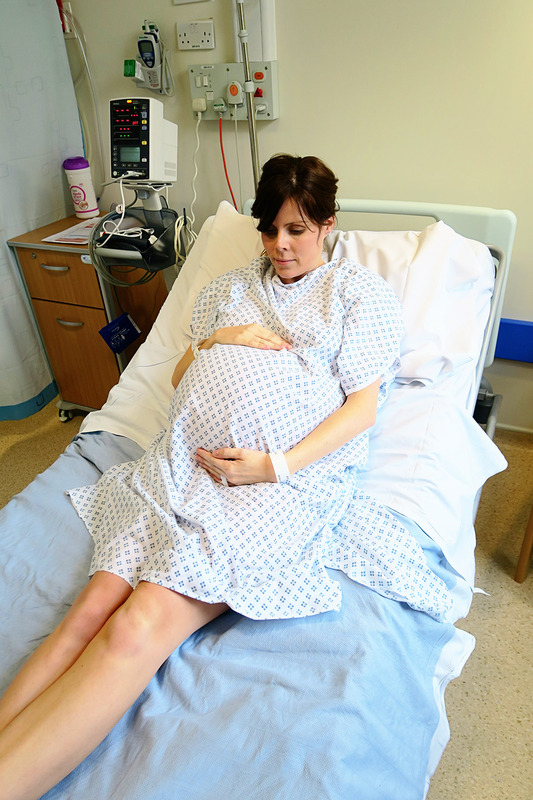 The consultant had made it clear that I would have a senior obstetrician in the theatre and that they would all be briefed for possible complications. I must admit I was so scared and it kept me awake at night on many an occasion throughout my pregnancy. A midwife came in and introduced herself, saying that her name was Jan and she would be looking after us during the surgery. She was a kind older lady who told me she was retiring next year and she immediately made me feel at ease. She kept flitting in and out the room, making sure we were ok and she told us that they would be having a briefing with all members of the theatre staff, before the anaesthetist and surgeon would come in separately to have a chat with me. They didn’t keep us waiting long, but I must have gone to the toilet about 10 times due to nerves. Firstly the anaesthetist came in. Immediately I loved him, he was a kind man with a calming accent, we were trying to figure out where he was from but couldn’t, possibly somewhere in Eastern Europe. He was kind, with a slightly joking manner which really made me feel calm. He explained the process even though I already knew, that he would put a cannula in my hand with a local anaesthetic, before putting a spinal block into my back which would completely numb my lower half. Then he was gone and three lady doctors came in- a junior doctor, an assisting obstetrician and the senior obstetrician who would be doing my surgery. I felt at ease that as promised a senior obstetrician would be delivering our baby, she was a kind lady with a nice smile. She explained that she knew of my potential complications and that she would take her time and not rush. They explained the procedure again before saying they would see us in theatre. The anaesthetist popped in again to try and insert the cannula in my hand, but as with LL’s birth he put it in and collapsed my vein, so had to take it out again. He made some joke about being disappointed in himself and said he would try again in theatre. 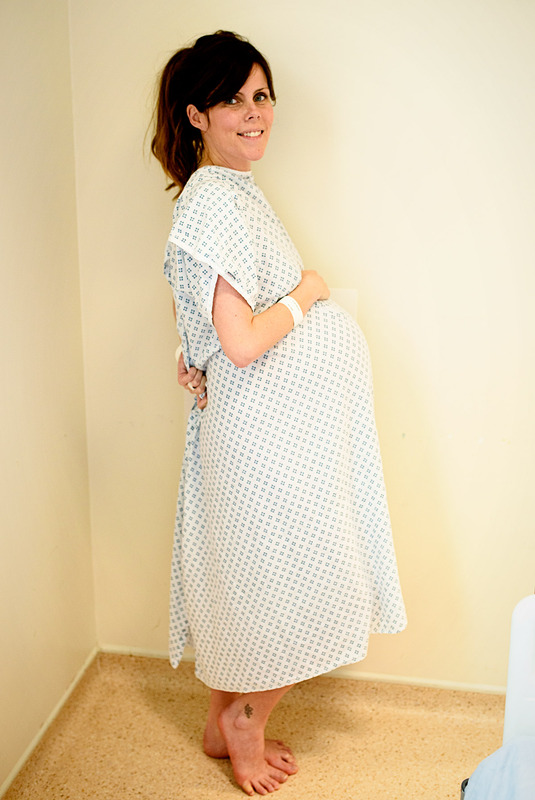 The midwife came back in and said it wouldn’t be long so to get into our theatre clothes ready. We amused ourselves by taking a few photos to document the last of my bump but I think you can tell just how nervous I was by looking at these shots. It was then time to go. Immediately I felt sick with nerves and my heart was beating like crazy. We then walked that surreal walk down to the theatre, it is so odd walking barefoot through the labour ward knowing you are walking to meet your baby. We headed through the doors into the theatre and I thought I might cry with nerves, it’s such a clinical and strange environment to be in and you just walk in and hits you. 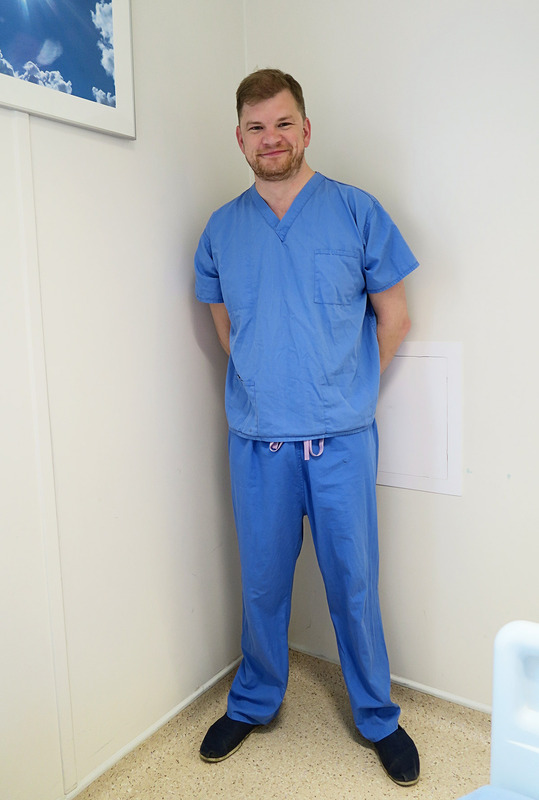 There was about six people in theatre when we arrived, a few theatre staff, the midwife and the anaesthetist, which eventually made eight once the surgeons came in. The atmosphere was jovial and they joked that they didn’t have a radio so we would have to listen to their bad singing- the midwife even did a little dance. I was told to sit on the bed with my feet on a stool. The anaesthetist tried the cannula in my other hand which went in straight away this time. He then sprayed my back with some super cold bacterial spray which made me jump, before putting what can only be described as a big sticky plaster on my back. It was then time to administer the spinal block. I had to keep really still and while I could feel it going in my spine, it really only was a small scratch and the cannula hurt more. I then lay down and waited for my legs to go numb. It’s a strange feeling with your legs going numb and it’s not one I particularly like. You can feel them slowly losing sensation. They kept spraying cold water to see if I could feel it going cold. Eventually they were completely numb and they signalled that it was ok for the surgeons to come in. There was a bit of confusion as they didn’t turn up for a while and the anaesthetist kept moaning, while the midwife joked they were having a cup of tea somewhere. The anaesthetist kept stroking my shoulder and asking if I was ok, he was incredibly reassuring and kind. Once the spinal had completely set in, I did have a moment where I went incredibly faint and a little out of it. I can’t really explain it but I just felt so dizzy and the only thing I could do was lift my arms up and cover my face as it felt comfy to do it, but this kept interfering with my blood pressure cuff so it kept beeping. I felt so tired and funny, it really wasn’t a nice sensation. The midwife commented that my heart was beating incredibly hard and the anaesthetist gave me some anti sickness drugs through my cannula, but he said that it was just the fact my blood pressure was low and my body was reacting to the anaesthetic. Eventually the surgeons came in, smiled, said hello and said they were going to begin. Mr E was gripping my hand really tight, they popped the large blue screen up so I couldn’t see and just started. It’s a weird thing as obviously they are concentrating so they don’t really talk to you and you don’t really know whats going on. It’s true what all the magazines and info tell you, you definitely can feel things going on, it feels like tugging, pulling and pushing. I felt so nervous and that combined with low blood pressure and a fast beating heart meant that I ended up being sick, Mr E had to hold a bowl for me to be sick into. We thought it was going to take a long time due to my scar tissue, but a few minutes after they made the initial cut the midwife said the baby would be here soon. We held our breath and after feeling some tugging, at 10.06am we heard the most glorious sound- our baby boy’s first cry. I promptly burst into tears, it’s such a strange euphoric moment, one that is just so incredible, you feel such relief that you hear a cry but yet you can’t see them. However just to hear a cry it just means they are here safely. From when I lay down to our baby boy being born, the whole process took 6 minutes which was unbelievable as I really had believed it would be a long time due to the scar tissue. Our baby boy kept crying and Mr E went over to see how he was getting on. We had previously discussed with the midwife that she would take him over to do his initial checks, administer his Vitamin K injection and weigh him, then all being well she would pass him to me for skin to skin. This is something which I didn’t have with either of the girls, but I was happy I was going to get a chance this time around. Mr E went to see him and I could just about make out muffled voices and laughing as when she laid him down on the scales he promptly weed all up the wall. It’s slightly a strange feeling as by the point I still hadn’t seen our baby. He came back over, told me he was 9lb 5 (they later realised they converted it wrong and he was actually 9lb 3) so a good weight like we had originally thought, and that he looked lovely. All the while the surgeons were concentrating on delivering my placenta and sewing me back up. The midwife finally bought him over to us and I saw my baby boy for the first time. I was surprised to find that I thought he looked tiny, even though looking back he was really quite big and puffy in the beginning. He seemed shorter than Mads and LL were when they were born. She unwrapped his towel and awkwardly placed him on my chest so we could have skin to skin. It was the most wonderful experience of my life, just like it had been with the girls. It’s so hard to hold them and see them properly when they are placed so close to you but I cuddled him and stroked his face. After a while the anaesthetist said that was enough as him quite heavy and being placed on my chest was affecting my blood pressure. He was wrapped in a towel and given to his Daddy to have his first cuddle. While all this was going on the surgeons were still hard at work. I could feel a lot of tugging and pressure, which I thought was weird as supposedly they were done with that part. Higher up my tummy towards my rib I could feel pain, it made me cry out and I said to the anaesthetist that surely I wasn’t supposed to feel it. He just said that due to the scar tissue from previous c sections they were spending time massaging it and cutting away adhesions- it was quite painful at times and I willed for them to be over soon. Eventually, about 40 minutes later they were finished. The senior obstetrician came to talk to me and smiled and said Congratulations. She mentioned that it was really straightforward and nothing like she had originally expected, but she said that it was good they had gone in prepared. Then they were gone, it’s such a funny experience as they obviously do this at least a couple of times a day, but to us it’s one of the most intense moments of our lives. The midwife inserted my catheter, which of course I couldn’t feel at all. The rest of the staff transferred me from the theatre table to a waiting bed, which I again find a strange experience as they all lift you using a big sheet. At one point they lifted my knee up and it unnerved me a little as I literally couldn’t feel a thing. They then all said their congratulations once more and then I was wheeled down the corridor to recovery, all the while holding our baby boy next to me. Once in recovery the anaesthetist who helped push said well done and that from his point of view everything was great. He gave me a set of antibiotics in my drip and then said his goodbyes. I had an awkward moment where I said to the midwife that I thought he was such a lovely and nice man, and how much at ease he put me at, and I didn’t realise he was still in the room! A little embarrassing but at least I wasn’t being rude about him! The midwife left us to it, knowing I had done this twice before she just said at some point in the next half an hour I needed to try and feed him. We pretty much did this straight away and he latched on pretty well instantly, although he only opened his mouth a little bit in the beginning. We cuddled him, stared at him in awe, had lots of skin to skin, and then Mr E got him dressed in his first little outfit. Being in recovery is like being in your own little bubble, we had the room to ourselves until the second c-section came back a bit later on. We chatted, text friends and family and spent those first precious moments with our baby boy. I eventually had some water and a couple of bits of toast followed a while later, which I devoured. Slowly I started to get the feeling back in my legs which I was happy about, although of course it started making me feel quite sore as well. Below is one of my absolute favourite photos I think we have ever taken, taken just as we arrived on recovery. Eventually around 3.30pm they were happy with my observations, they keep checking blood pressure, heart rate, temperature and your bleeding, and said that I could go over to the postnatal ward ‘Lilac Ward’. I was pushed over there in my bed, Mr E following with our baby boy in his cot. Once there we were put on Bay 2, the higher dependancy bay for ladies who have had a c-section. When we arrived there was only one other lady on there, but in the end there one other lady came on as well. We did pretty much the same thing here, just relaxed, took it in turns to hold our baby boy and just generally marvel at how amazing he was. The midwives/care assistants kept coming round to check on us, give me painkillers, check my catheter and check my blood pressure. Mr E went to pick the girls up from school and nursery as we wanted to make it as normal as possible for them. Later that evening, at 6pm my mum, sister and sister’s boyfriend came to see me. They bought me a balloon, some flowers from my stepdad and my mum also bought me a little boy charm to match the little girl ones on my charm bracelet. It was lovely to see them and I felt as proud as punch having them coo over him- they all fell in love with him instantly. By this point the anaesthetic had completely worn off and they kept making me laugh- laughing and coughing are by far the most painful things to do after a c-section! They stayed with me for a couple of hours, before my sister went over to our house to sit with the girls while Mr E came back to the hospital till 10pm. I got a little emotional when it was time for him to leave, as that first night you really are fully dependant on the midwives to even get baby out of the cot. The first night was exactly like it had been with the girls. He pretty much slept the entire night long, not even really waking for a feed. I on the other hand didn’t sleep I wink. It was a combination of feeling sore, not being able to get comfy in my hospital bed, the fact that he was quite sick with mucous and also just the general noise of the ward, plus of course adrenaline I presume. I wished I could sleep but I just couldn’t, and they also kept coming round to give us painkillers and do observations. The next morning was pretty much the same, hospital is a little monotonous, although we had the paediatrician come round to do his check which she was happy with. He was booked in for a hip scan at 6 weeks, mainly because Mads has a history of DDH, but she said his hips seemed fine and that it was just a precaution. The Bounty lady came round and bizarrely remembered us because we had a huge discussion about photography when I was in there with LL. We took it in turns to hold our baby boy, cuddle him and just generally enjoy the calm before the storm. Around midday I was told my catheter had been in 24 hours and that it could be removed so I could start to get mobile. That came out no trouble at all, just a bit of an uncomfy sensation, and then I was told that I could get up whenever I felt comfortable. I was so nervous about getting out of bed, knowing that this was by far the worst bit. It is so sore trying to manoeuvre yourself up and off the bed when your stomach muscles have been cut. I eventually did it and hobbled hunched over to the shower with Mr E. He really is a husband in a million, he helped me on the toilet, helped change my pad and helped me get undressed. When I was in the shower I think the room was too hot because all of a sudden I felt so ill and thought I was going to faint, Mr E had to call for the midwife and between them they had to help get me dressed and back into my bed. It was a strange moment, I literally felt out of it and lay on the bed for a few minutes to recover. The rest of the day was more of the same, just lying in bed. Mr E bought me two magazines but I didn’t read them, I just lay there cuddling my baby boy. Due to ward visiting hour restrictions he had to leave between 1 and 3.30pm so he went off to pick up the girls again. At 3.30pm I got a text saying that he was just parking up at the hospital with them so they could come and meet their baby brother- my tummy had butterflies waiting for them. They peered nervously around the cubicle curtain and tentatively stepped into the room, but just as I expected they absolutely loved their new baby and took turns in holding him for a good hour or so. The midwives kept coming to talk to them and they were so well behaved and polite with them. I took a few photos (which I will save for another post) and then they all headed off to take them back home so my sister could look after them. Mr E arrived back a short time later accompanied by my Dad and his wife, it was lovely to see them and they stayed a good hour or so. Then Mr E headed home earlier for the night around 8pm and my sister came back to sit and chat with us until 10pm when the ward shut. The second night was different to the first in that I actually felt like I could sleep this time, but couldn’t due to a combination of him now wanted to be fed more, a lady opposite me snoring (snoring is the worst sound in the world I think!) and of course them doing their checks. I still had to get help with getting him out the cot by ringing the call bell and he was still quite sick with mucous so I didn’t sleep much that night either. I couldn’t wait for Mr E to arrive the next morning. Wednesday morning I was told I could go home by lunchtime that day if I felt up to it. I really appreciated that the midwives didn’t pressure you to go home. I had heard that our hospital was doing the enhanced c-section recovery program, where they try and get you up and out after one night, but this wasn’t mentioned to me, they just assumed I would be staying in two nights. However by this point I was more than happy to go home, even though I was really sore, so I was told they would try and discharge us by midday. The morning involved a lot of waiting around, LL was with us too as we didn’t want to put her in nursery too much, but she was a really good girl. They were short staffed that day so kept us waiting quite a long time but eventually we were given our notes, painkillers and were discharged with the promise that a community midwife would be out to see us the next day. The walk from Lilac Ward to the hospital entrance is a long one and I felt every single step, but I was also so proud, especially of LL pushing her little brother. Mr E got the car and bought it to the entrance and we made the short drive home to start our lives together as a family of five. 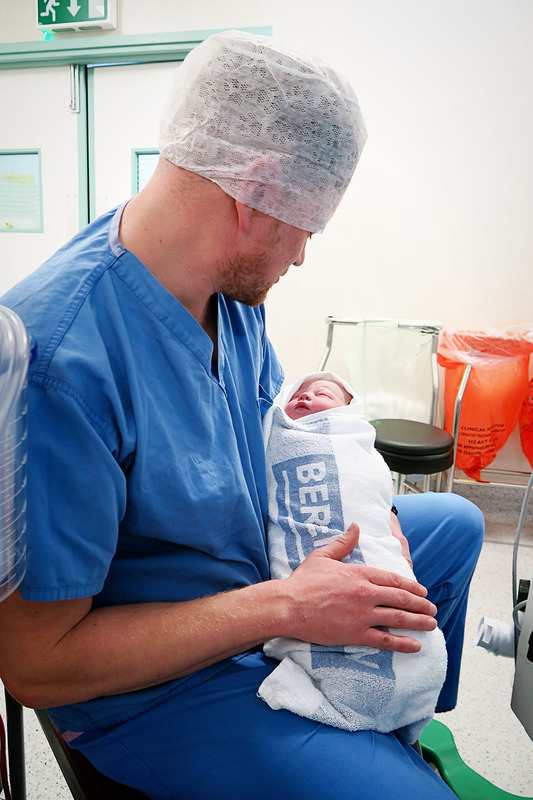 I had been so worried about my c-section, but it really was an incredible experience, every single member of staff who cared for us was so kind and compassionate, and I left feeling very lucky to have the NHS who delivered the third of my babies safely. Of course I was very sore, it was major surgery after all, but overall it was the most wonderful experience. I wish I could bottle it up and keep those feelings forever. We welcomed our third and final family member into the world. The missing piece to our jigsaw. We all adore him already. I really wanted Mr E to film parts of my c-section this time, mainly because if I could go back and watch the girls births again I would do in a heartbeat, there is something about video that photos just can’t capture. He was a little hesitant, worried that it would distract him from the moment, but I said just to do what he could and not put too much pressure on himself. He only filmed snippets but what he has captured I will treasure forever and it makes me cry every time I watch it. I was so unsure as to whether to share this video, only because it is probably the most personal thing I have ever shared, but at the same time I am so proud of it and also you don’t see many c-section birth videos so I wanted to show that it can be a really positive experience. I have held some things back and not put in the most personal bits of film, but I am really proud of this video. Such an emotional post. I will be watching the video once I have finished work. I am glad it all went well. He’s such a adorable little man. Oh my gosh your post and then video has just had be bawling my eyes out! I’m sitting here with my almost 2 yr old and 35+5 weeks. We are at hospital to o to find out if having our planned c section at 37 or 39 weeks (my daughter was emergency c section) and I am so ready to meet my 2nd baby girl right now but at same time so nervous about the op and leaving my daughter while there. This really has helped, thank u so so much for sharing g such a personal time. Your family is gorgeous by the way! What an amazing, emotional video. I’m sat here sobbing! So beautiful, how lovely that you have this to look back on. I wish I had some videos from my first moments with my daughter. It had only been 4 months and already some of it is so hazy. So lovely to have video of your girls meeting their brother for the first time! Congratulations! Such a lovely post. It’s amazing that you’ve captured so much detail. It will be lovely to look back on in years to come because memories really do fade. C-sections do sound pretty horrendous, but it’s great that you were so well cared for. It’s amazing how quickly he was delivered! I love that you took so many photos. Back in my day we had film cameras and would never have thought of taking a photo of me in hospital with my bump before having the baby. Many congratulations again Katie. I thoroughly enjoyed reading this and feeling the emotions along with you of it all. He is so lovely and I am happy it all went well for you! Gorgeous pics and a really good write up! Whilst my first was a section and more of an emergency situation I wasn’t prepared for, it all sounded so familiar and actually in the moment I was rather relaxed with the lovely theatre people… quite amazing really. So very lovely. Thankyou for sharing those precious moments. A privilege to watch them. It’s made me very emotional as our 2nd baby is due on Saturday! Oh crap I just cried reading your post and than I just had to of course watch video and cry again. So beautifully put together, so beautifully filmed, edited, emotions and shared your lovely lovely journey to becoming a mother of three. What an amazing thing to document. I wish I could go back and take even photos. I have only one of each child and that makes me so very sad. It’s such a miracle what our bodies can create and do. Huge huge congratulations again and again babes. Beautiful video! Your detailed ‘story’ reminded me so much of my own section.